Getting leg work done by distracting players with the ball. The drill starts with player A passing the ball to player B, they have to complete three passes before they can attack the goal. Player C has to defend them but he first has to run around the green cone- he can only start when A plays the ball. 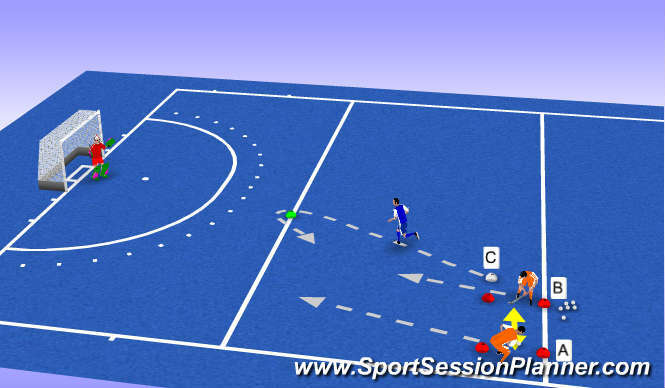 If player C wins the ball then he must score between the red cones. - Make the drill as competitive as possible, so that players don&apos;t think of the amount of running they are doing. 1) Different age/skill groups might require different amounts of passes between players A & B to ensure that the drill is competitive and player C feels like he has a chance. 2) The distance/speed of the running can be changed by moving the drill closer/further from the goals.